Yes, I’m still around and there hasn’t been a better and more important time to subscribe to The Reinhardt Report. A major market correction is imminent. Next week (if you haven’t renewed by then) all subscriber accounts that have yet to renew will be removed and we will start from scratch. After your account is removed you may renew over at enronnext101.wordpress.com and I’ll get you back on the site. The markets can only continue on this current path for so much longer. And it is time to start paying some very serious attention to the/my leading indicators. But first.. time to do some long overdue business. With the exception of lifetime subscribers – pretty much every subscribers’ subscription has expired and the next couple of weeks everyone will need to renew. After your account is removed you may renew right now. The markets will NOT continue on this current path for so much longer. This Is My Public [i.e. free] Website. I Am “Reinhardt” (google it – if you’re not familiar: “reinhardt wall street”; then maybe add “legatus” to the search). 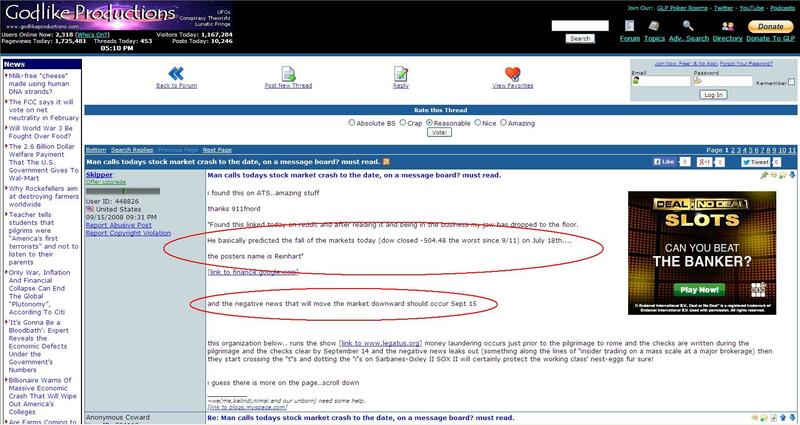 My [“Reinhardt’s”] September 15, 2008 stock market prediction discussed at 18:25 into the video link below. The above was published on Monday September 15, 2008. THE exact day of THAT market crash. That article was not written on that day. That article was written in advance just in case the prediction actually happened. And it did. 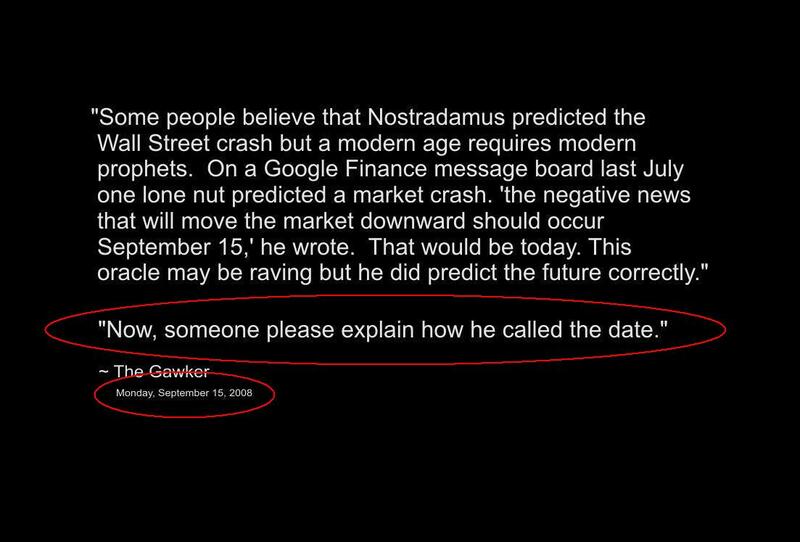 A lot of people were watching quite closely prior to September 15 2008. If you really want to research further (much further) just google “reinhardt legatus”. The prediction angered a lot of [self-appointed “alpha-males”] people as well, but it also woke a lot of wise people up. The site you reading/are on right now (enronnext101.wordpress.com) is my public website. My private website site (which will be 8-years old on February 09, 2016 ) where I follow news and events (geopolitical and geoeconomic) that allow me to predict market crashes and explain to subscribers in detail “how I called the date” of September 15, 2008 and how I will be calling the date of the next crash is not free. Because I’ll be within no greater than two weeks of market crash accuracy. Stock markets are not speculative. Stock markets are predictable. Totally predictable. The cost for a one-year subscription to my private/pay-site is currently $200.00 and will be increasing to $300.00 and probably higher very soon. A subscription also includes all three volumes of my history of economics books.